The decline of Stack Overflow? At the time, I remember thinking that this seemed like somewhat of an unfair statement. That was mostly down to the fact that when I joined the community (many years ago), I had fond memories of a smooth on-boarding, and never experienced any snarky remarks on my initial questions. Yes, gaining traction for noobs is very, very hard, but there is a good reason why it exists. For me, SO is invaluable. How else would I be able to pretend to know what I’m doing? How else could I copy and paste code from some other person who’s obviously a lot smarter than me, and take all the credit for it? Anyway, once I had read the post, and gotten on with my life (e.g. copying and pasting more code from SO), I did’t think too much more about the post. Maybe I had just been lucky with my foray into the SO community? 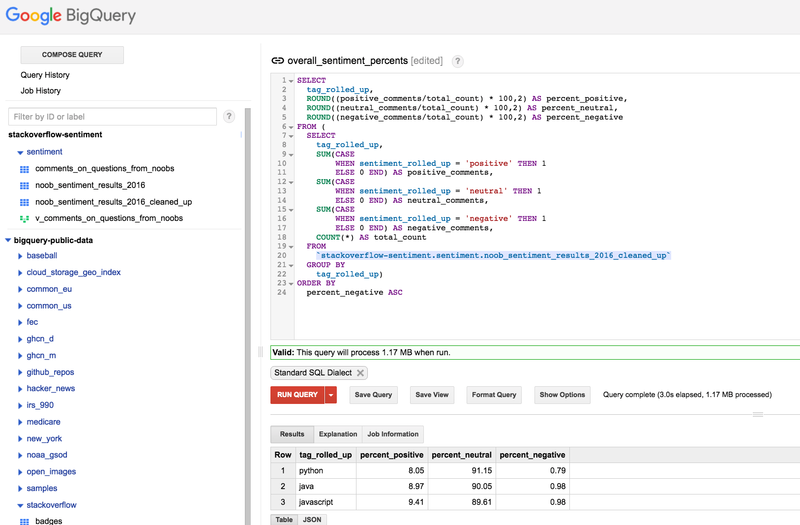 However, just last week, I was reminded of that post once again, when I noticed that BigQuery (BQ) now has a public dataset which includes all the data from SO – including user comments and answers. Do you see where I am going with this yet? If not, then don’t worry. Neither did I when I started writing this. BQ: craft some SQL to extract all comments made on questions posted by noobs (SO reputation <= 1). 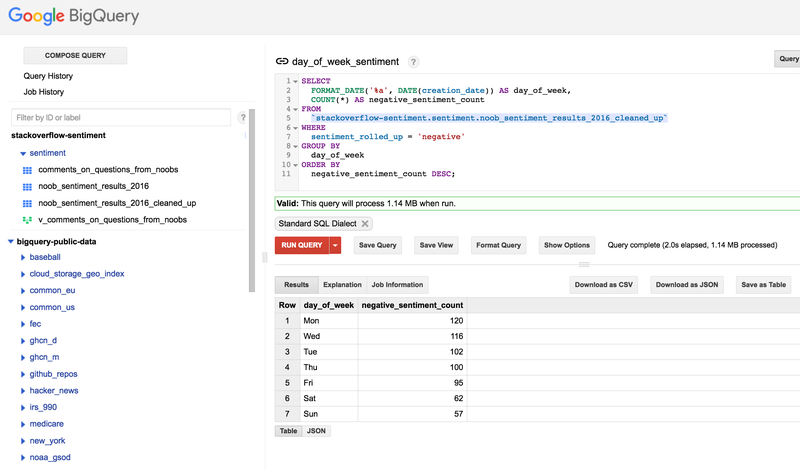 Dataflow & Natural Language API: spin up a pipeline to execute the SQL from 1, and process each comment to get a sentiment score using the Google Natural Language API. BQ: analyse the sentiment results. Over the entire dataset, there were ~250K comments made on noob questions. See next point. The NL-API currently has some strict limits i.e. only 1000 API requests per 100s. Ouch. The NL-API is (obviously) not free. Taking those three points into consideration, I trimmed it down to just analysing just one year’s worth (2016). I cut it down even further by only looking at either JS, Java or Python tagged questions (three languages I use regularly enough). Applying both of those filters left me with a manageable dataset size of 69662 records/comments to flick through the NL-API. Outstanding! Disclaimer at this point: I don’t really know a whole lot about how the incredibly complex world of machine learning works under the hood. I’m not smart enough. But the beauty of it, is that I don’t have to understand. I leave all that up to the whizzes at Google, and who simply provide an API for folks like me to use. Also, I’m neither a statistician, nor a data analyst so my results may be…ehh…questionable in terms of accuracy, correctness, confidence levels etc. Hence the disclaimer. One of the awesome things about BQ is that it’s so bloody fast. Like, insanely fast. We love using it at Shine. However, this can also make you lazy at times because it affords you the luxury of not having to worry too much about writing inefficient SQL. Of course, when you’re dealing with massive datasets in production, then you definitely want to be thinking of efficiency – even when using BQ. Listen up: I’ve shared the query publicly here, and you can also find the public dataset with some of the tables I created along the way here. I also saved the query as a view to make the pipeline code easier to read (see next step). 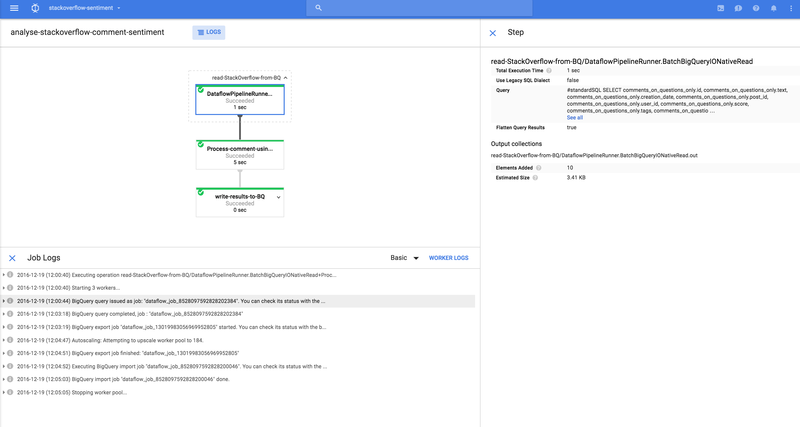 Google Cloud Natural Language API reveals the structure and meaning of text by offering powerful machine learning models in an easy to use REST API. You can use it to extract information about people, places, events and much more, mentioned in text documents, news articles or blog posts. You can use it to understand sentiment about your product on social media or parse intent from customer conversations happening in a call center or a messaging app. You can analyze text uploaded in your request or integrate with your document storage on Google Cloud Storage. The score of a document’s sentiment indicates the overall emotion of a document. The magnitude of a document’s sentiment indicates how much emotional content is present within the document, and this value is often proportional to the length of the document. A document with a neutral score (around 0.0) may indicate a low-emotion document, or may indicate mixed emotions, with both high positive and negative values which cancel each out. Generally, you can use magnitude values to disambiguate these cases, as truly neutral documents will have a low magnitude value, while mixed documents will have higher magnitude values. For this test, I didn’t believe analysing the magnitude was necessary because what I was trying to analyse were just comments (max 300 chars), and not lengthly prose text or paragraphs. However, if you were to use NL-API on large text samples, then you do need to consider the magnitude. See here for a detailed explanation. Moving on. OK, so I didn’t really have to use Cloud Dataflow for this part of my experiment. I could have just as easily ran the query directly in BQ, download the results, and parse each row for sentiment analysis using a Python script, or even just some simple bash cat | awk | curl magic. Yes, Dataflow was a bit of overkill to be honest. But, I wanted to demonstrate the ease of wiring up several tools/services on GCP, so that if you plan on doing something similar (but with much bigger datasets) then it will scale. Well that, and I just wanted to show off that I know how to use Dataflow too. With 2 workers in the pool, run the SQL from step 1 against BQ. Process each table row (record) using a simple `ParDo` (dataflow distributed function). The ParDo calls out to the NL-API (yes, synchronously!) to request the sentiment score for each comment. Write the results back to BQ for more SQL analysis. * Created by Graham Polley | Shine Solutions on 23/02/2016. 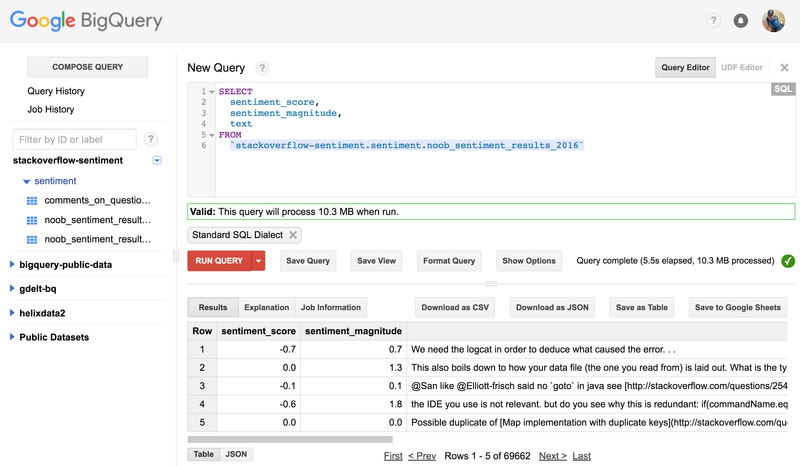 * A quick and dirty Dataflow pipeline that analyses Stack Overflow sentiment. // -- Boring credential stuff. Remember to add the correct scopes. Here’s what the pipeline looked like while it was chugging away, and running on two GCE (n1-standard-1) instances. Because the NL-API limits requests to 1000 per 100s, I simply let the pipeline do its thing while I got on with trying to figure out what to do next. To finish it off, I ran this SQL over the top of it to clean, and roll up the tags and sentiment scores into Strings – `positive`, `neutral`, or `negative` to make it more results more humanly readable. Let’s recap. I now had all comments for 2016 (tagged with either JS, Java or Python) made on a noob (reputation <= 1) question post, and each one had a sentiment score assigned by the NL-API. Next came the fun part. The average sentiment score is-0.1026. In other words, it’s neutral. So, the overall comment sentiment for 2016 on noob questions is in fact neutral – at least according to the NL-API. This doesn’t align to the ‘hates new users ‘ statement! On the contrary, there are a total of just 652 negative comments compared to 62810 neutral and 6200 positive. 1 0.9 java Lookup abstract base class and virtual methods. 3 0.9 python @DavidZemens Useful info, thanks! 8 0.9 java Improved readability, updated the title. 9 0.9 java I would recommend using [simplejson](https://pypi.python.org/pypi/simplejson/), works great for reading JSON-files. 10 0.9 java @Tunaki: Excellent finds, I used the first one. 2 -0.9 java `Compilation failure [ERROR] /var/local/modular/src/main/java/demo/SecUserDetails.java:[6,8] demo.SecUserDetails is not abstract and does not override abstract method isEnabled() in org.springframework.security.core.userdetails.UserDetails`, doesn’t this suggest that you should override `isEnabled()`? 6 -0.9 python Your code outputs `(7, 3)`, it does not use `numlist`, it might return `None` if the `if` is never executed; it is unclear what it is supposed to do, or why you called it `sum_2_array`. 7 -0.9 java Do you mean to say — you want to set Pass / Fail result in testNG results ?? This was a really fun blog post. Hooking up all the tools, and dabbling with the NL-API was really quite interesting, and it has given the team some ideas on how it could be used for some upcoming projects that we have in the pipeline. I don’t think there’s anything particularly wrong with your algorithm, it’s a fairly straightforward and practical way to go, but there are a lot of situations where it will get make mistakes. There’s lot more that could be done with this data i.e. much deeper analysis. Maybe you have some more ideas for analysing the data? Or you’d like to extend the queries some more – how about analysing the entire dataset and plot the sentiment across time! If so, please feel free to take any of my code/queries and re-use modify as you see fit. Then ping me with your results. I’d love to hear from you. Previous Will Athena slay BigQuery?